By Alex Fischer (University of Oxford), M. Sirajul Islam (icddr,b), Tazrina Habib Ananya (Bangladesh University of Engineering and Technology) and Syed Adnan Ibn Hakim (UNICEF). The new Sustainable Development Goals (SDGs) global baseline data for Bangladesh reflects the significant progress and scale of the challenges ahead to achieve ‘safely managed’ drinking water for all by 2030. Over half the population (55%) has safely managed water (on premises, on demand, free from contamination) in 2015 (WHO/UNICEF, 2017). Despite increasing ‘improved access’ to 98% by 2015 to meet the MDG, the SDGs reveal a similar share of the population with ‘safely managed’ water as in 1990. This in the context of doubling the population, which is now estimated at over 168 million people, two thirds of which are living in rural areas. The SDGs reflect the need for new thinking and models which build on the progress of infrastructure investments but examine the institutional arrangements to ensure drinking water is safe, reliable and affordable for all. Since independence in 1971, the Government of Bangladesh reported impressive results achieving nearly universal access to improved drinking water sources for both rural and urban populations. The national average increased from 65% coverage in 1990 to nearly 98% in 2015 (WHO/UNICEF, 2017). This achievement is particularly striking when considering the scale of infrastructure required to keep up with the growing demand: the population has doubled since 1974, increasing by 70 million people (BBS 2011). Achieving access to improved drinking water infrastructure therefore required significant investment in new and expanded infrastructure networks. In 2015 an estimated 10% of the population was connected to piped water systems through 136 formal, public and regulated piped water infrastructure schemes (DPHE 2016; WHO/UNICEF 2017). 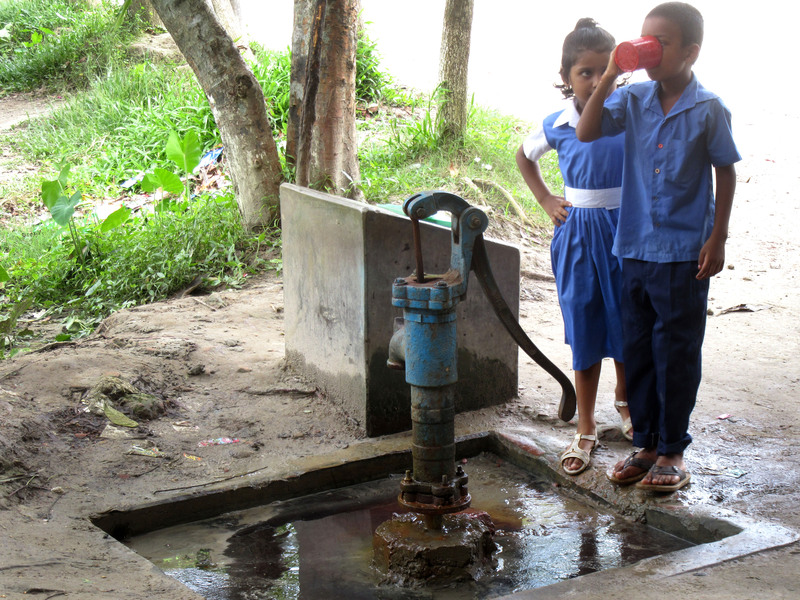 While piped systems are expanding with the government planning up to 180 new small-town systems, the current high levels of improved access are achieved through millions of mostly privately-installed handpumps. To put this into context, a 2009 report by the Bangladesh Bureau of Statistics estimated 11 million tubewells are installed across the country; 1 million provided by the government and 10 million installed by private owners (BBS 2009). This number will have increased significantly since this estimate. However, in Bangladesh, the improved access target has been overshadowed by uncertainties around affordability, reliability and most significantly, water quality and safety. The SDGs formally recognize that although improved access is an important step, addressing other risk factors is critical to achieve safe and reliable drinking water for everyone, every day. To explore the impact of this growth across these risk factors, a multi-disciplinary team from REACH including University of Oxford, the International Centre for Diarrhoeal Disease Research, Bangladesh (icddr,b), UNICEF and the Government of Bangladesh’s Department of Public Health and Environment (DPHE) conducted a Water Audit across 10 villages in Chandpur and Comilla Districts. Ten female field staff from the villages went door-to-door to inventory every water point, mapping 3830 tubewells. They found a 230% increase in the number of predominantly private tubewells installed since the 2008. This decreased the population-to-infrastructure ratio from 17 people per water point in 2008 to 7 people per water point in 2017; the 2010 national ratio is 14 people per water point. This growth rate raises other questions about how to achieve safe and equitably managed drinking water in the context of increasing number of unregulated private water systems. Water quality, specifically arsenic-safe tubewells, remains a serious risk in these villages. The recent Bangladesh Bureau of Statistics Multi-Indicator Cluster Survey (MICS) estimated over 44% of the population in this district are still exposed to arsenic levels which exceed government standards (WHO/UNICEF 2017). Our study found that less than 5% of the tubewells were tested for safe water when first installed; and 80% have no red/green marking for arsenic safety. This allows significant uncertainty for consumers, government and service providers striving to make decisions about the safety and use of the water points. Consumer preferences are also changing with a growing portion of private investment directed towards electric pumps, deep tubewells, and water points built inside walled structures within household premises. The majority of the handpumps, 90% at the time of interview, were functional. Of those, 10% of owners and managers reported their wells have been previously broken (no water flow), but are now functioning again. This reflects the high-rate of reported annual investment to maintenance and repairs. While these findings are provisional with additional analysis underway, this study reinforces projections of private investment’s role in drinking water supplies and potentially new horizons in public and private models to promote ‘safely managed’ drinking water. The significant rate of private capital investment in new tubewells and the reported high-rates of household-financed annual maintenance, suggest an expanded frontier for potential funding and management models. These new models will need to address the ongoing risks in water safety for newly installed water points, changing preferences, and equity of safe and affordable access. These topics are the subject for the forthcoming phase of analysis. For more information about the study findings and implications, please read the policy brief. The study is part of a collaboration between the Department for Public Health and Engineering, UNICEF, icddr,b, BUET and the University of Oxford. It was coordinated by Alex Fischer (University of Oxford), in partnership with Zakir Hossain (icddr,b), Tazrina Ananya (BUET), Syed Adnan (UNICEF) and Firoza Akter (DPHE). The study was supervised by M. Sirajul Islam (icddr,b), Dara Johnston (UNICEF) and Rob Hope (University of Oxford).